Fit Service — Bringing Bikes and Bodies Together - Higher Ground Bicycle Co. The fit is the essential part of comfort, balance and efficiency on a bike! We believe in it so much that every bike sold at Higher Ground comes with a free fit — a value of $75-$175. At Higher Ground we were fortunate to be one on the first shops in the nation to begin formal training in this area (Specialized BG Fit). 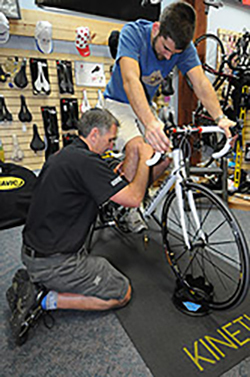 Since that first class we have been involved in numerous training programs and certifications in the Bike Fit Process. Through all of this we have developed a fit process that incorporates scientific principals with the art of the rider. We focus on getting to know the characteristics and the need of the rider to find what position and balance serves them best.